I have a grandfather Clifford Jones that went to the race either to drive or to crew. His Name was Clifford Jones and his wife's name was Julia. They lived in Battle Creek. Does anyone remember this name?. The old Jones Speedway is in the left-center of the photo with the V shaped pond in what was the infield of the old track. The black and white aerial photo on this site shows an old race horse exercise track owned by a local vet. 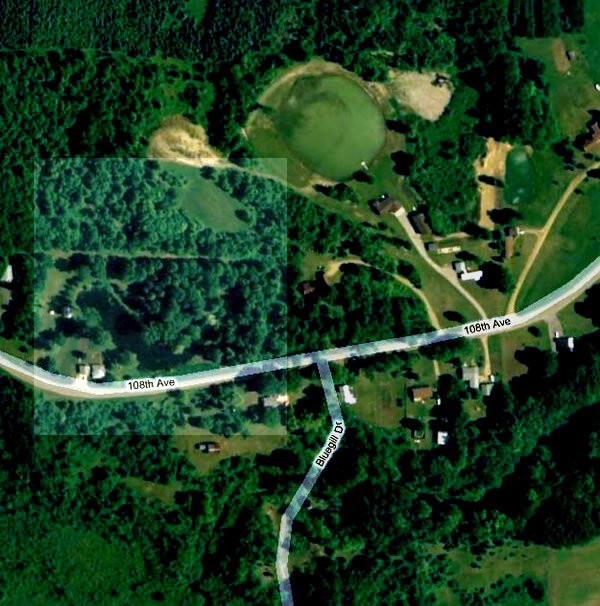 The actual location of the Jones Speedway is approximatley 1 mile to the south-southeast of that photo. The track is pretty much obliterated today but the son of the track owner has a house built near what was turn one and a pond in the infield. I grew up in the area and went there with my family on Saturday nights to watch the races. Sometimes on Sunday mornings the track owner would give some of us boys a dollar to pick up trash in the bleacher area. Still love dirt track racing!. The two tracks you mentioned are different tracks. 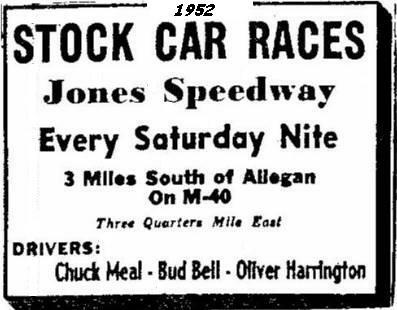 Jones Speedway was indeed just south of Allegan. It was promoted by the Jones family, thus the name. It ran from 1950 to about 1960. It was always a dirt track. I would love to see photos from there. M-40 Speedway (or now called Thunder Valley Speedway) is a relatively new track. The neat paved oval opened in 1997. It is located near Jones, Michigan, which would be about 50 miles farther due south of Allegan. The new track is located 2. 8 miles north of SR 60 on SR 40. If this is the same speedway as M-40 Speedway it is now called Thunder valley Motor Sports, (not to be confused with Thundervalley inthe UP), is a paved 3/8 D shaped oval in Jones according to their Website which is www. thundervalleymotorsports. com/and is indeed opened. track looks great from the photo on the website with a real pit row and a ton of cars.